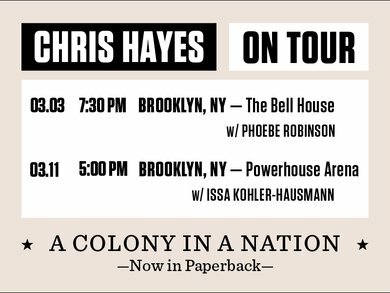 Emmy Award–winning news anchor and New York Times best-selling author Chris Hayes argues that there are really two Americas: a Colony and a Nation. America likes to tell itself that it inhabits a post-racial world, but almost every empirical measure—wealth, unemployment, incarceration, school segregation—reveals that racial inequality hasn’t improved since 1968. With the clarity and originality that distinguished his prescient bestseller Twilight of the Elites (“a stunning polemic,” said Ta-Nehisi Coates), award- winning journalist Chris Hayes offers a powerful new framework in which to understand our current crisis. 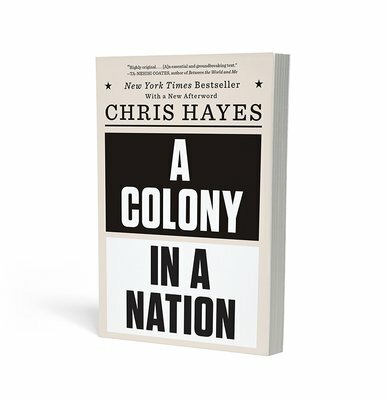 Hayes contends our country has fractured in two: the Colony and the Nation. In the Nation, we venerate the law. In the Colony, we obsess over order; fear trumps civil rights; and aggressive policing resembles occupation. How and why did Americans build a system where conditions in Ferguson and West Baltimore mirror those that sparked the American Revolution? Blending wide-ranging historical research with political, social, and economic analysis, A Colony in a Nation explains how a Nation founded on justice constructed the Colony—and how it threatens our democracy. Chris Hayes is the host of All In with Chris Hayes on MSNBC, the author of Twilight of the Elites, and an editor-at-large at The Nation. He lives in Brooklyn with his wife, daughter, and son.